Full details about Civic Day on Saturday, June 17 can be found on the back page. revealing the depth of thinking which students bring. “From first year, students are encouraged to form their own informed responses to project briefs. The success of this approach is evident in the diversity of beautifully crafted strategies and spaces, from the heart of the project ideas to the wider city connections. 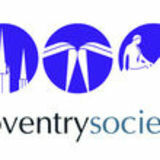 The optimism of Coventry’s people and rich architectural heritage are reflected in the students’ proposals. Through these ideas, we see the cultural manifestation of society in architecture. Inspiration for all … we invite you to imagine, share thoughts and together, create the new inter-disciplinary dialogues for the future.” Individual approaches by students have been wide-ranging and diverse, from roof terraces in the sky, to viewing balconies in the council chamber and forest tree-like columns making up main structures. One student expressed his thoughts: “Through all conflict and debate people forget that democracy is a coming together of people from all different Origins and Cultures who work as one to achieve and provide solutions allowing civilisation in Peace and Harmony.” ►Course director Katherine McNeil, is a member of the Coventry Society and regularly attends our meetings. Co e tr So iet ele rates the atio al pro otio of i i pride o Saturda , Ju e . This ear e fo us o the th A i ersar of the Ci i A e it A t 9 that esta lished the o ept of o ser atio areas. Our e e t is ased at the histori Old Gra ar S hool, a d e te ds to Lad Her ert s Garde a d Hales Street, o part of a ide ed Burges Co ser atio Area. We ill e spotlighti g the rege eratio pla s for the Burges as ell as the da lighti g of the Ri er Sher our e. This ear our e e t is part of Co e tr s Positi e I ages Festi al as ell as the Year of the Sher our e a d e ill e usi g it to pro ote Co e tr s id to e Cit of Culture. •Quill aki g orkshop •Joi a tour of the Cit Walls ith the Deep Fat Fr er at . oo harges appl •Childre ’s a ti ities •Meet the Co e tr A assadors Our tha ks to our part ers for their assista e a d o tri utio , i ludi g Culture Co e tr , the Cit Cou il, War i kshire Wildlife Trust, a d to the I stitute of Histori Buildi g Co ser atio . The pop-up galler a d art spa e i the for er Telegraph s offi e i Corporatio Street as de lared ope last o th the urre t editor Keith Perr ith a group of i ited guests i atte da e. The proje t a e a out after the e o er, Ia Harra i , allo ed the site to e used as a reati e spa e u til ork starts o the o ersio of the uildi g e t ear. The pop-up gallery has won the financial backing of Historic England/Coventry Heritage Action Zone and has been created entirely by local volunteers, who have partly restored the front entrance, lobby and atrium garden. To e a le the proje t to e lau hed, Co So e er Ala De er, olu teered to ork o getti g the uildi g read to ope to the pu li . O e of the first tasks as to ri g together photographs that help tell the stor of the CET a d orga ise guided tours of the i o i uildi g, Other highlights include work by Coventry University architecture students, a Medieval Watchtower project by Luke Bryant, a display looking at the legacy of Coventry’s post-war re-building and a 3D computer montage of the city. From the start CovSoc had seen this as a golden opportunity to use the Telegraph as a start-up ‘Urban Room’. And our chairman spent many hours bringing together illustrative material that showcases the post-war city centre in the form of four pull-ups put together on our behalf. These now form part of the display in the reception area of the former Telegraph. Curre tl the pop-up is o l ope o Saturda s he - i ute guided tours of the uildi g take pla e, ut ith ore olu teers it is hoped to e te d the ope i g hours. We u dersta d that as a Ur a Roo e are pro a l the first i Britai to e de lared ope for usi ess. Others are i the pro ess of ope i g i Hereford a d York. Pi tured are t o of the pull-up prese tatio s produ ed our hair a . The prese tatio to the left tells the stor of Do ald Gi so s iso . To the right is the stor of our pio eer traffi -free shoppi g pre i t. The lassi ie of the three spires as take fro a earl oloured post ard. 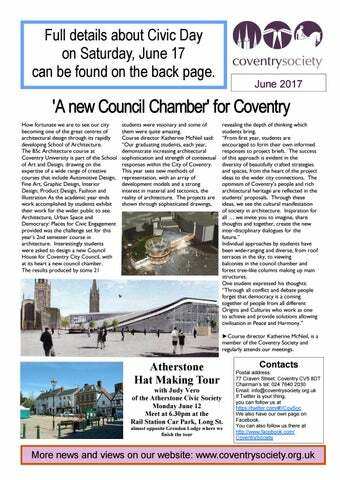 The June 2017 edition of the newsletter of the Coventry Society (UK). We hope you enjoy reading it.